Nowadays, the interior space of your home is like gold. When condos are going up that are the size of my apartment’s balcony, we all have to make better use of our home’s interior. The square footage in your garage is just as valuable since it usually becomes a dumping ground for things no one wants to store in the house proper. One of the first things you should be considering what you have in your garage currently and what you want to keep and what you want to perhaps get rid of at your next yard sale. It’s amazing how many things get dumped in your garage that you will never use again and really should’ve been thrown out in the first place or donated to your favourite thrift store. Now that you have gotten rid of excess storage. It’s time to figure out where to put everything. Cabinetry is a great way to hide all of the items you don’t want to see every day getting into the car. We can install rust-proof steel cabinets for your tools so you can have that automotive/man-cave look or if you want, we can create custom cabinets to create more slick look. For other storage, you might even consider using something like Metro shelving, a heavy-duty commercial steel shelving system that is high recommended with a weight capacity per shelf of 800 lbs. As well, storage can also be done using our PVC slat wall. For a completely adjustable consideration, PVC slat wall can accommodate everything from various hooks, baskets to store your hammer and other tools like rakes, brooms, long ladders to simple wire shelving on which you can store all of your boxes. The best thing to keep in mind is to store as much as you can vertically. Another way to help with freeing up floor space is to have storage shelving hanging from the ceiling. Not only is it a great way to store off-season items but it’s strong enough hold some of your car tires as well. 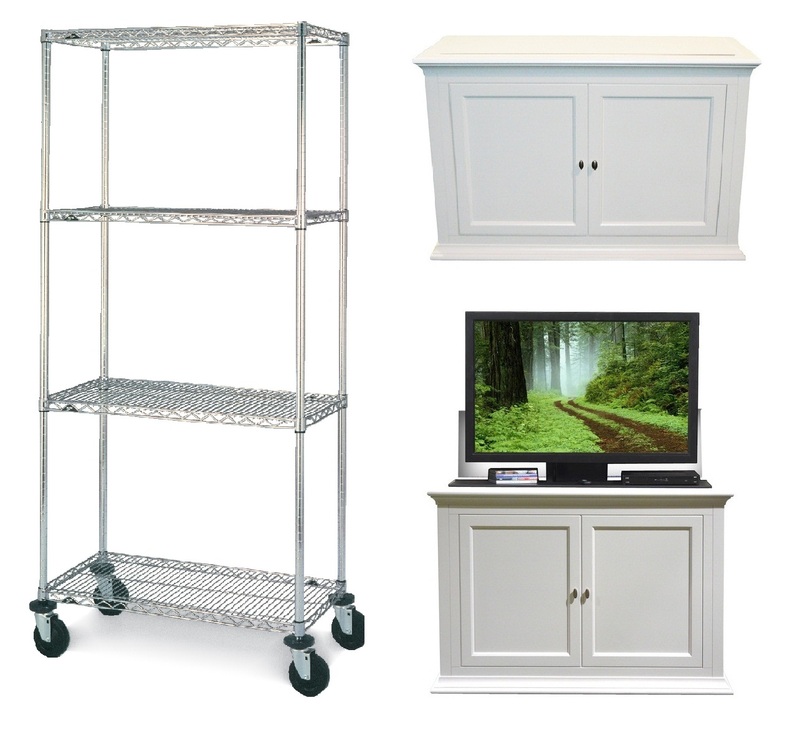 We do have wall unit to store your tires as well but it’s all a matter of how utilize your space best. 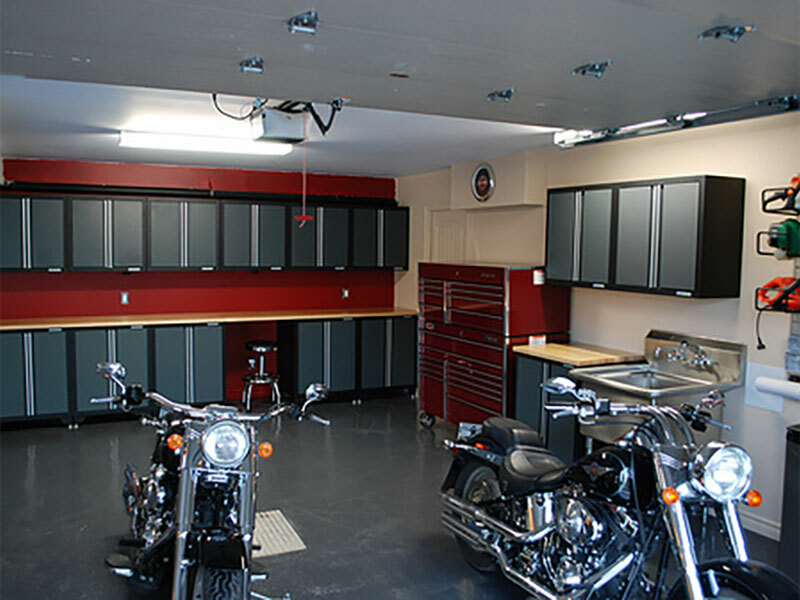 Is your garage mainly for storage and off-season items or is it more of a showcase for your buddies to drop in and hang around in. Maybe you should be considering comfortable seating and somewhere to put a large flat-screen television. A pop-up TV unit is a possibility or perhaps built-in cabinetry to surround a flat screen. Now that you have your walls organized, well hopefully, consider what you have on your garage floor. Most people don’t realize that your concrete floor is very porous and will absorb everything from oil dripping from your car to salt ,rust and other items such as salt. Something to also consider as your garage floor ages, you might want to seal the cracks and level the floor with a floor coating product. In preparation for the polyurea process, we diamond-grind and seal all of your floors’ cracks. Polyurea seals the floor from moisture, rust, salt and petroleum products seeping into your concrete floor and staining it. 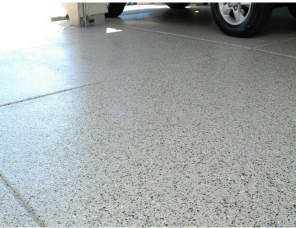 This is a great way to seal your concrete floor as well as add a decorative and durable touch to your garage’s look. Once the concrete is sealed, we apply a fleck which comes in a variety of colours making the entire coating not only decorative but extremely durable.